This grilled lamb chops recipe is chock full of good things like garlic and fresh herbs. It is also very easy to prepare. Smash garlic cloves, drizzle with a bit of olive oil and salt and chop/grind it until it forms a paste. Scrape into a bowl, add the herbs and pepper and combine thoroughly. Rub the paste over the chops. 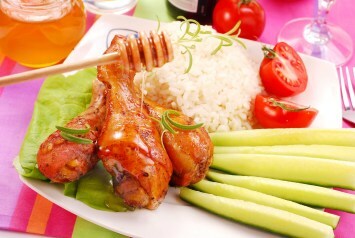 If possible, cover and refrigerate for at least 30 minutes for the flavors to meld and the chops to marinate. Preheat a grill pan or cast iron skillet over medium high heat. Cook the chops for 2 minutes on each side. Reduce the heat to medium-low and cook until desired degree of doneness. Cook about 3 minutes more for medium rare. Exact cooking time depends on the size of the chops. Set aside on a cutting board to rest for 5 minutes before serving. 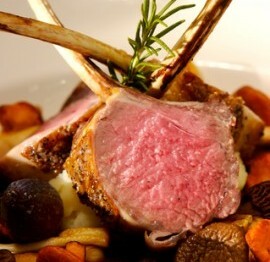 Some people shy away from lamb, thinking that it has a strong taste, but lamb is actually a mild meat. Lamb chops are quick to cook. They tend to taste best with garlic and rosemary, so most recipes you will find seem to go with those flavors. Grilled lamb chops is an easy gourmet recipe that is perfect for entertaining. They look so lovely on the plate and your guests will find them delicious. And the best part? Not only are they delicious, they are also quick and easy to prepare. Remember that most people like their lamb chops cooked fairly rare, sometimes medium, never well done. This is a fabulous diabetes recipe. Very low carb and quite healthy. Pair these lamb chops with a huge salad and lots of vegetables like steamed asparagus and green beans almondine. If you like this recipe, I’d love you to Pin it to Pinterest, Tweet about it, Like it on Facebook and share your recipes below. 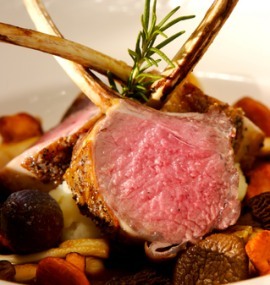 If you like our lamb chops recipe, have a look at our other tasty meat recipes.